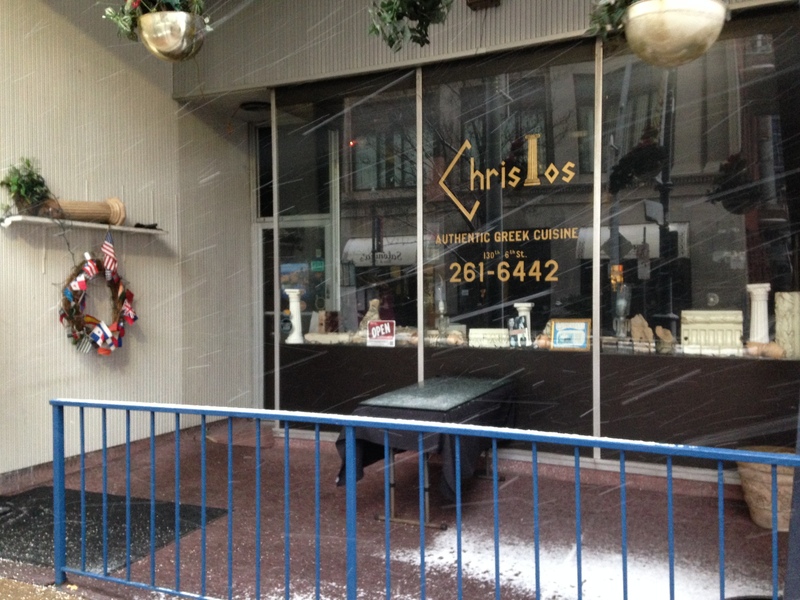 Christos Mediterranean Grille doesn’t look like much from the outside, sandwiched between Alihan’s Mediterranean Cuisine and Café Milano in the 100 block of 6th street in downtown Pittsburgh, but it packs a lot of character and charm into its menu and the 400 square-foot dining room. You might first think that the restaurant is a bit cluttered, as a lot of the big chains are, with this and that pinned to the wall for decoration, but upon further inspection you can see each item must have a special meaning and story for owner Christos Melacrinos, a Greek from the old country wearing the pride of his well-lived life on his sleeve. The tables are small and seem to be rearranged to fit the seating needs of the moment. Only the smallest of gaps are left between your party and the one sitting next to you, in some ways providing the same communal experience you get at a big Greek family dinner. The menu is filled with the staples of Greek dining: lamb, grape leaves, pastitsio, cheese pie, spinach pie and baklava. 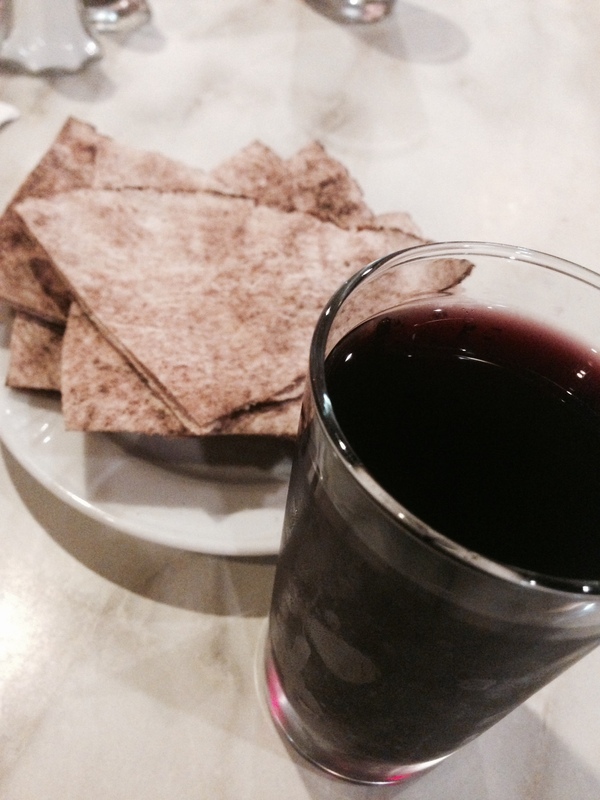 The wine is even served in a small cylindrical glass, just like in the tavernas along the beaches of Greece. We, of course, didn’t get the chance to sample the whole menu, but the large plate of cheese pie and the chicken kebab served with rice and string beans were excellent. If you take a good look at the walls you will see photographs covering at least a hundred years of family history, some taken in Greece, others taken in portrait studios or at school. The glass-faced wooden hutch in the center of the room if filled with other knickknacks of family and Grecian past. None of these items get the prominent placement of a collection of items dedicated to the memory of Jacquelyn Kennedy Onassis. A Jackie O doll and the Life Magazine covering her wedding to Greek shipping tycoon Aristotle Onassis are front and center. Why the fascination (beyond the fact that Jackie married a Greek man)? As a younger man, Christos was the personal chef of the former first lady and her second husband. He lived and worked aboard Christine, the Onassis’ super yacht (it was formerly a Canadian Coast Guard Cutter, but that’s another story). 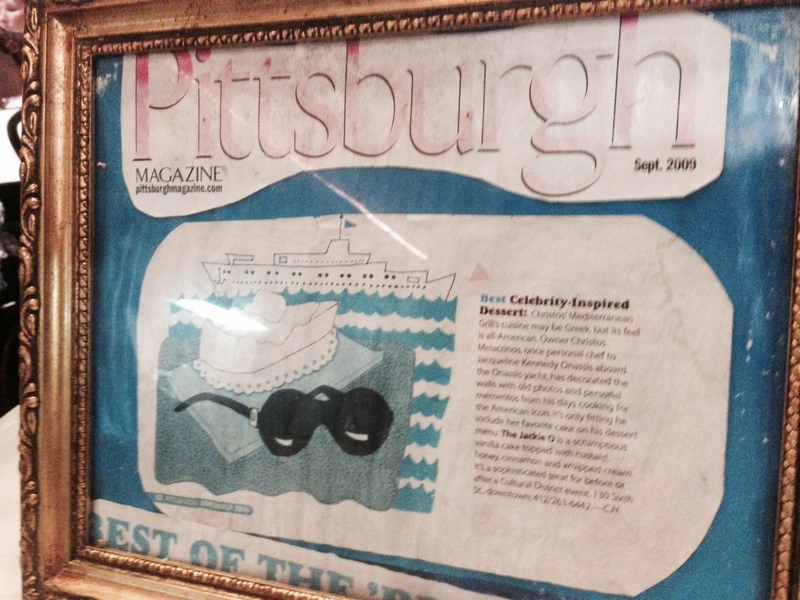 This Pittsburgh Magazine clipping proclaims the Jackie O the best celebrity-inspired dessert. When you’re finished with your dinner (all entrees under $14) Christos will come to your table and ask if you want dessert. You can hardly say ‘no’ as he explains with great pride the confection he created for the former first lady, and if you don’t believe him he’ll show you the clipping from Pittsburgh Magazine about the dessert. The Jackie O is a vanilla cake topped with Greek honey syrup, custard, whipped cream and a dusting of cinnamon — all for $3. The generous slice of cake is so light it might float off the plate, and it tastes wonderful. I like eating at places like Christos. I like going into a place with a story, a place where you can’t escape the pride an owner has for his business, a place where you know everything will be done to the best of the ability of the staff because cutting corners isn’t in their repertoire.